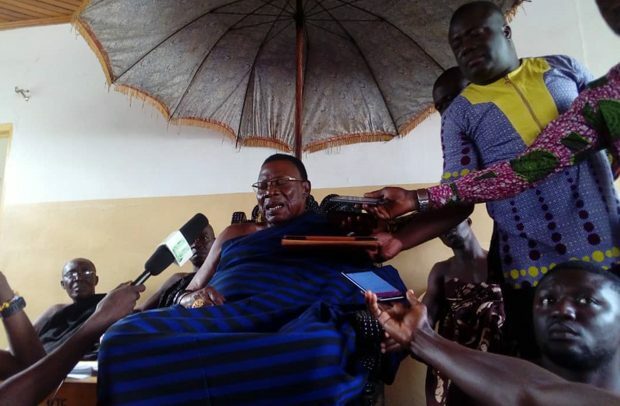 NANA WIAFE Akenten III, the Paramount Chief of the Offinso Traditional Area in the Ashanti Region, has commended Augustine Collins Ntim, Deputy Minister of Local Government and Rural Development, for bringing development to the area. The traditional ruler noted that A. C. Ntim, who is the Member of Parliament (MP) for the Offinso North Constituency, has initiated several developmental projects such as schools, electricity and income-generating avenues for the youth and women in the locality. Nana Wiafe Akenten III made the commendation when the minister met with the traditional leaders at their council meeting to evaluate plans for the celebration of the Offinso Mmoaninko festival which will be held later this year. He encouraged the MP to continue his good works in serving the people of Offinso North and South and Ghana as a whole and urged others to do same for the rapid development of the nation. On his part, Collins Ntim expressed gratitude to Offinsomanhene and Nananom for their prayers and support given him since becoming the MP for the area. He assured them of his personal and governmental support to develop the district. He told Nananom that the Akufo-Addo administration had secured funds to set up machinery to cultivate and process food and cash crops under the ‘one district, one factory (1D1F)’ programme. He hoped the project would help between 5,000 and 10,000 farmers. He assured the chiefs that his ministry would assist 96 farmers to cultivate cashew nuts, 30 in coffee production, 20 in palm oil and others. He said the project would first start on a pilot basis for the ministry to determine its flaws and sustainability before it would be executed fully nationwide. “The president has said he doesn’t want to replicate the mistake the previous administration did under the Komenda Sugar Factory so we are first starting on a pilot basis,” he stated. He applauded President Akufo-Addo for his innovative ideas on flagship programmes such as planting for food and jobs, promoting two export commodities by each district, afforestation programme for the youth, cocoa production and other interventions to boost the economy.